This thing is tiny. According to the info at Cult Pens, it's 93 mm long when closed, and expands to 142 mm long when you remove the cap and put it on the other end. As for the width, it's a snug fit around a short international cartridge. It's much more like putting a nib on a cartridge than putting a cartridge in a pen. It's so tiny it will even fit in the #pockets in women's clothing with room to spare. If you're really in a hurry and can't be bothered to post the cap, you have around 86 mm of pen, which is getting a bit small even for my small hands, but is usable for scribbling a few words. Cap and barrel are aluminium, making it very light for a metal pen; only 11 g.
So, the scribbling words bit. I'd poked around the internet for reviews, and one thing that bugged several people was the cartridge that comes with it; apparently a black ink but more like grey. I have plenty of quality international cartridges knocking around so fed it with a Graf von Faber-Castell deep sea green instead. I did not wash the pen through and dry it first, which has a bearing on the writing feel when I first started using it. It was skipping a lot and feeling very scratchy, with a distinct and tiny sweet spot. I did wonder was it a bad nib or was it just manufacturing oils, but after a week or so of occasional use it smoothed out quite a lot - still a bit scratchy but no skipping. It would probably have helped to prime it properly rather than running the nib under water and then scribbling for a couple of pages, but to do that I would have had to fill a thin convertor and stick it in the back of the barrel, push through some ink, and then take the convertor out again, because this thing is far too short to take a convertor as its actual ink supply. I did not think of the "and take it out again" bit until afterwards, but may try that on the second pen I bought. 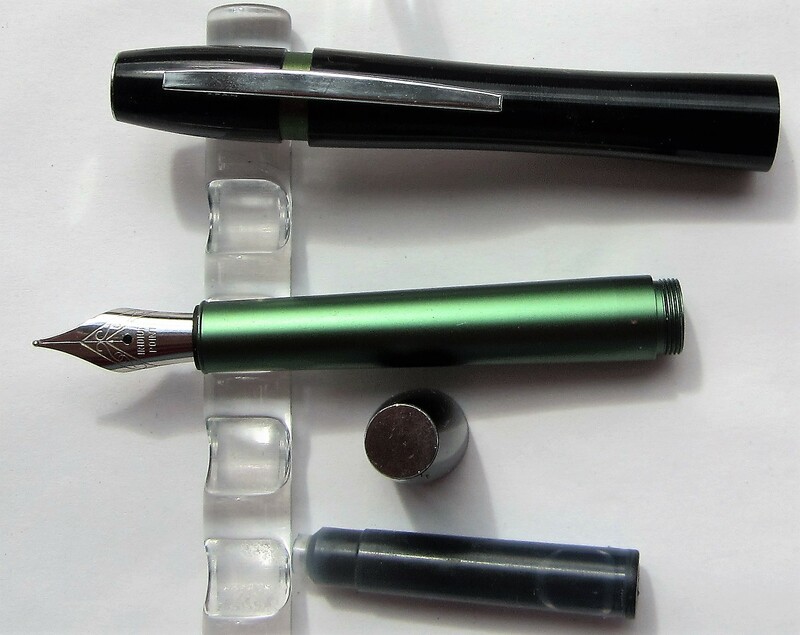 The pen comes from Japan but the nib is unbranded and marked "iridium point" on the green/black one I bought and "iridium point Germany" on the orange/silver, along with a simple but pretty engraved pattern. It's apparently a Japanese medium or European fine, so it's going to be inclined to scratchiness anyway. I can live with it, and it still manages a little line variation. I can't tell how easy it would be to swap it out, but at that price you're not losing a lot of money if you mangle it. Ditto if you feel like adjusting the nib. It has a clip. I generally don't have a use for clips, but this one seems tight and springy. It's tiny. Tiny enough for #pockets. And yet big enough to write with comfortably. The nib's not great but is usable.